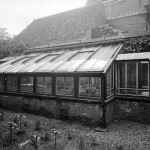 Delft’s Biological Labs 2: The originals.. 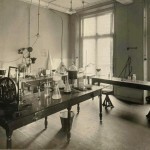 Sadly, there are no pictures of the first “microbiological laboratory” and the building was demolished at the start of the 1890s, but by collecting the occasional descriptive comments from Antoni van Leeuwenhoek’s letters, we can gain a glimpse of the room where so many types of microorganism were seen for the first time. The following is an extract from our book “Antoni van Leeuwenhoek: Master of the Miniscule” which is scheduled for publication by Brill, Leiden (Brill.nl) in April, 2016. Antoni van Leeuwenhoek worked in his comptoir. The word literally means a counting or writing room, but it was actually his workshop. 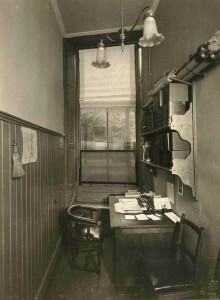 It was located in an annex to his house so that he would not be disturbed. 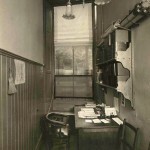 The room was partitioned off with wainscoting, with a hole to accommodate the spring pole of his lathe. The bottom two of the four windows overlooking the street could be opened upwards, and were fitted with wooden shutters. His workshop could be closed off “so that little or no air enters from outside”, but if he was working with a candle, he preferred to open them a little, and cover the window with curtains. His letters and the inventory of the house compiled after the death of his daughter Maria reveal some of the equipment and materials that he used. 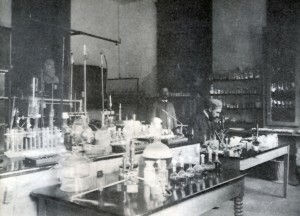 As well as his lens and microscope making equipment, there was a small furnace to extract gold and silver from ore, a barometer, a salt water aquarium, sharp blades, chemicals (including the distillate “brandewijn” for conservation and saffron for colouring), and a collection of specimens ranging from minerals to the testicles of a rat preserved in spirits. 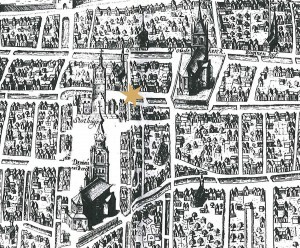 He had a balance with weights, a glass-blowing table with a lamp, and an anvil for the production of his microscopes, and all of his surveying equipment. Many of the objects that Van Leeuwenhoek studied came from the immediate surroundings of his home. He had two gardens, one adjoining the house with a well and another outside the city. He kept a green parrot for a long time and examined the excrement of the sparrows in his yard after feeding them. Delft’s fish market was just across the canal from his house. Since he regularly attended the dissection demonstrations at the neighbouring Anatomy Theatre, it seems likely that he brought samples home. Additionally, in a few of his letters he mentioned that sailors returning from voyages brought him exotic samples. 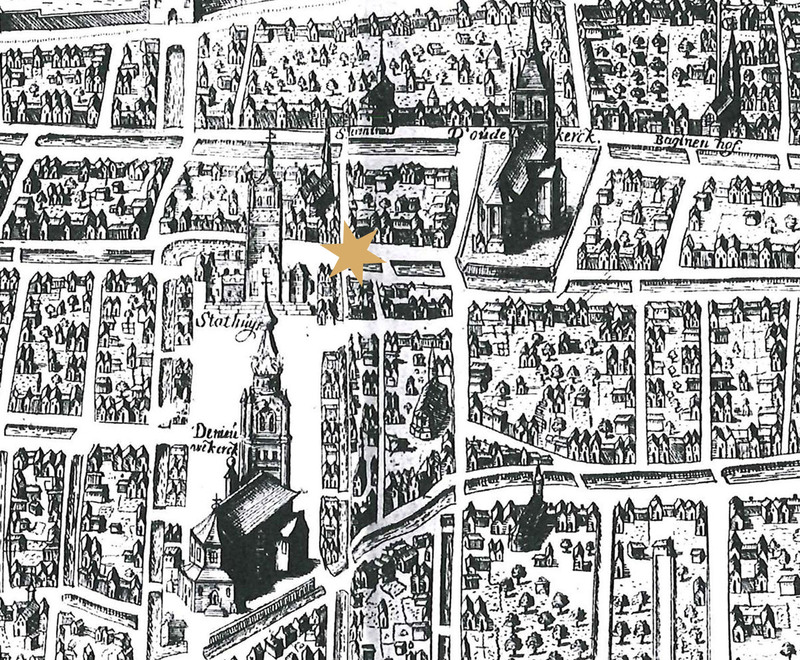 The star shows the position of Van Leeuwenhoek’s house in relation to the Town Hall, where he worked, the marketplace and the Old Church where he is buried. “I would like to explain the need for the appointment of Dr. Mr. W. Beijerink as Chief of the Bacteriological Laboratory of the Yeast Factory…..
factory will be a cause for celebration and a public holiday…. We would have a quality supply of yeast, which would overcome the sharpest competition; our yeast would be able to circle the world in 80 days, without spoiling. It cannot be claimed that Beijerinck was happy as an industrial scientist. He felt responsible if errors incurred financial losses, and his interests were much wider than required by his job. 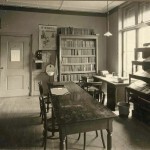 As can be seen from the table below and his laboratory journals, he seems to have normally had several unrelated lines of research running at any one time. Only the rows marked * involved work needed by the Factory. *Methods: auxanograms, gelatine plates, Chamberland filters, sampling stratified cultures, microbiochemical analysis. 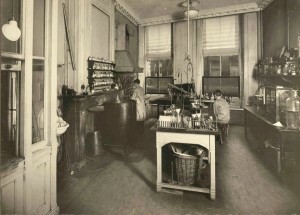 When his sisters, Henriette and Johanna, visited him in his laboratory, Henriette reported that he “sat there, surrounded by a mass of retorts, bottles and glasses, boxes, corks and heating apparatus, so that it looked like the workshop of an alchemist”. Eventually, Van Marken and a few others managed to persuade the Delft Polytechnic (now Delft University of Technology) that they really needed a Department of Microbiology with Beijerinck as its Professor. Until his new lab was ready, he continued to use the laboratory at the Yeast Factory. 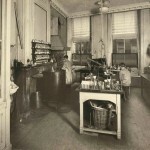 Their support continued for the rest of his life – when Beijerinck retired, the Yeast Factory paid for the construction of a laboratory in the garden of his retirement house in Gorssel. 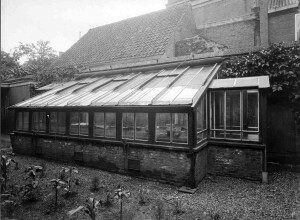 After his appointment as a Professor, Van Iterson initially worked in Beijerinck’s lab , but in 1908 he was given space in a house at Oude Delft 81, a building used for temporary accommodation by the Polytechnic. 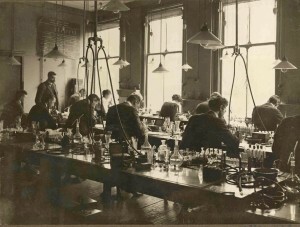 As can be seen from the photographs, the rooms were small and not really suitable for use as teaching laboratories. 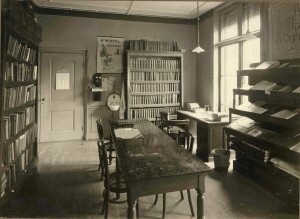 The office, and the library were tiny, and the greenhouse was far too small for a Department called “Applied Botany”. 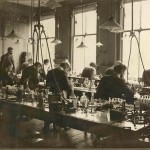 It wasn’t until 1911, when he was offered a job in Java, that the Polytechnic agreed to start work on a purpose-built laboratory and Botanic garden. Both finally opened in 1917. 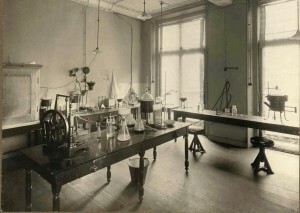 At the time of writing, the laboratory is now part of Delft University’s Department of Biotechnology, but the Department will move to a new building later this year. The Garden’s website is HERE.